When it is activated and in balance, it is easy to express yourself creatively or artistically, and you are comfortable and satisfied by your sensual and sexual experiences. There is an evident ease of being when the second chakra is spinning as it should. You’re at home with yourself and therefore sustain healthy relationships. You radiate fluid softness and know how to go with the flow. Yoga asana can stimulate the chakras. Svadhisthana is associated with the sacrum, the pelvis, the soft lower belly, and the organs of reproduction. Because it’s linked to the element of water, it can best be awakened through flowing, rocking, swaying and wave-like movements. Instead of sitting upright or folding forward, invite a gentle swaying into this pose. Notice where your pelvis meets the earth, and notice the gentle opening of inner thighs acting to free the pelvis. Get creative and bring movement all the way up into your belly — either by swaying or by twisting in a rhythmic motion. Pregnancy is a perfect time to keep the second chakra awake. Cat/Cow has the potential to stimulate the whole length of the spine, but you can do this pose in a manner that highlights your low, low back, low belly, and pelvis. Close your eyes and tune into the sensual nature of the shape. It doesn’t have to be sexual, but allow your sensory body to flood your awareness. Break from tradition and permit your body to move in its most natural, animal way: let there be side-to-side movement, a circular swaying of the hips. Anything goes! Break the second chakra free! On its surface, plank is quite the “yang,” high-energy, strength-building shape; but once you’ve got some comfort with it (and you can always bring your knees to the ground), it’s also a pose that lets you tap into the power of your deep belly and the natural support of your sacrum. 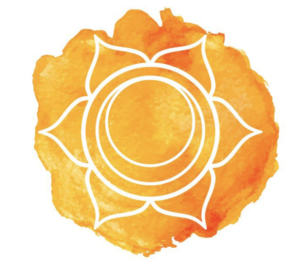 When done with a focus on the sheer Shakti power and essence of your sacral chakra, a whole new energy emerges — one that is powerful at the same time that it is soft. Once you are comfortable in plank, explore! Much like you did in Cat/Cow, bring some spinal undulation into the mix. Invite some side-to-side movement. Remember, there are no rules and that’s the beauty of this! You can land in side plank, or maintain an undulating, expressive pose. What’s important is to let your deepest, personal creativity shine through. Practice with your eyes closed. When eyes are open, the usual centers of the brain and usual points of focus take over. Closing eyes allows the rest of the senses to come alive. Nurture your favorite relationships — the ones that feel balanced and mutually delightful. Hum and sway at random moments through the day. This self-soothing practice can calm an anxious mind and bring you back into bodily existence and all its tasty wonder. Set some ambiance. Select colors, scents and candles or incense to please your senses. Make it a practice to rest in your sensuality without shame, even if you have to begin in private. The sacral chakra, when awakened, will harness the power of your senses, awakening your freedom to create, nurture, love and make love.